Thank you for your interest in seeking programmatic accreditation by the Accrediting Bureau of Health Education Schools (ABHES). ABHES is recognized by the United States Secretary of Education for the accreditation of private, postsecondary institutions in the United States offering predominantly allied health education programs and the programmatic accreditation of medical assistant, medical laboratory technician and surgical technology programs leading to a certificate, diploma, Associate of Applied Science, Associate of Occupational Science, Academic Associate degree, or Baccalaureate degree, including those offered via distance education. ABHES accredits programmatically the three programs identified above being taught in both public and private institutions. ABHES is an independent non-profit agency unrelated to any trade or membership organization. An organization offering a program in medical assisting, medical laboratory technology, or surgical technology education is eligible to apply for and be considered for programmatic accreditation if it meets the following: (a) a public or private institution at the postsecondary level institutionally accredited by an agency recognized by the U.S. Department of Education or Council on Higher Education Accreditation (CHEA) whose principal activity is education, (b) a hospital or laboratory-based training school, or (c) a federally-sponsored training program. (See Chapter II, Section A, Subsection 1, b, of the ABHES Accreditation Manual). Application fee payment. Payment must be remitted in the form of a check made payable to ABHES and submitted via a trackable delivery method to the ABHES office at the time of application submission. For application fee details, view Fees Appendix of the Accreditation Manual. ABHES requires that this application along with noted attachments are to be submitted electronically via e-mail to applications@abhes.org. Payment should be submitted via a trackable delivery method to the ABHES office. All documents must include the required original signatures where applicable. For each email attachment, a separate file should be made and appropriately labeled (see screenshot below). The total number of attachments is dependent on the application plus the number of exhibits to accompany the application. 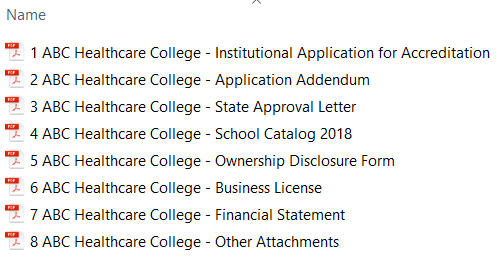 Each attachment/file should be named according to its content (e.g., “Application”, “Ownership Disclosure Form”, “Catalog”, “Current Business License”, “Attestation of Responsibility”, etc.). If you have any questions regarding this application, contact applications@abhes.org. For more details regarding the ABHES accreditation process, use the following links: Accreditation Timeline and The Accreditation Process. Refer to the ABHES Schedule of Events so that you may plan your time effectively.